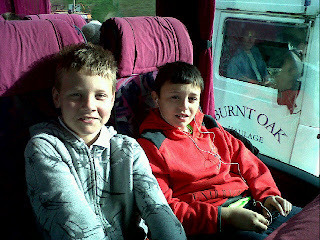 Year 5 left England at some ridiculous time in the morning heading for sunny France! We were all very excited especially as we saw the White Cliffs of Dover. At this point we launched into a rendition of the White Cliffs of Dover however Mr Mitchell thought it was bluebells over rather than blue birds. We had an excellent ferry crossing full of excitement and lots of giggles. When we arrived in France the children spotted many things that were different and many things that were the same. We stopped off at a fabulous aquarium to see; sharks, penguins, sea lions and also we were able to stroke the stingrays. From there we headed for the Chateau. We have had an OUTSTANDING first day completed by either archery or fencing. We are all now sleeping, well at least we are supposed to be! By the way you may want to know a very important piece of information. Mr Mitchell is now manager of the month on the fantasy football!!!! We have not heard the end of it! Looking forward to another action packed day tomorrow.